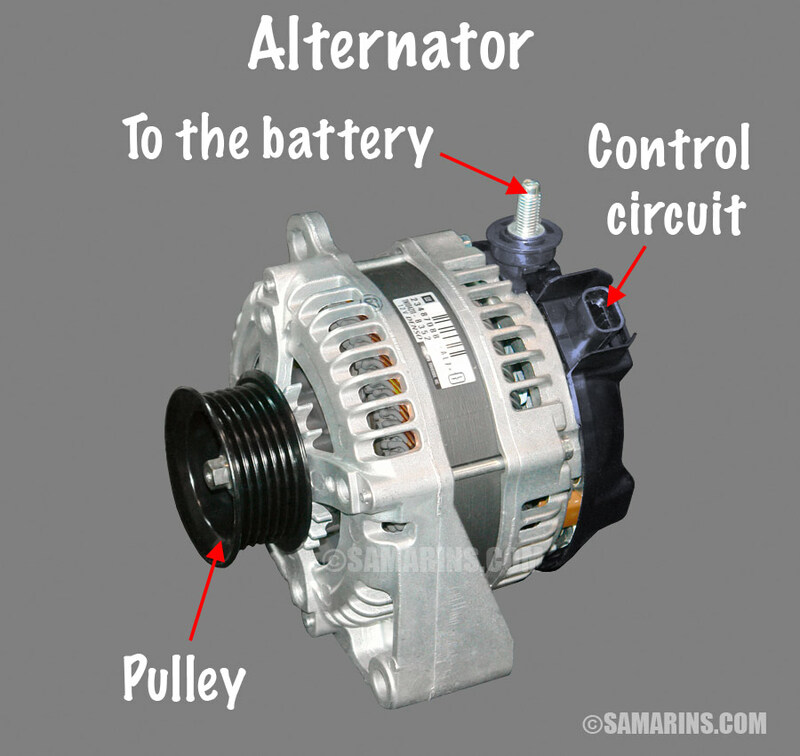 An alternator is a generator of electric power in a car and is a major component of the vehicle's charging system. 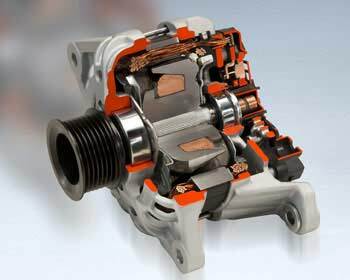 All cars with an internal combustion engine except for some hybrids have an alternator. When an engine is running, the alternator charges the battery and supplies additional electric power for the vehicle electrical systems. An alternator is bolted to the engine and is driven by a serpentine belt (drive belt). 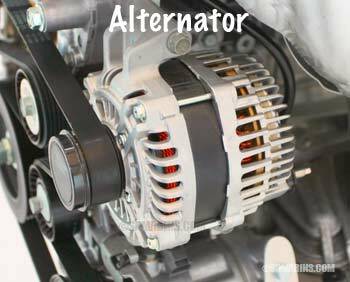 An alternator is a maintenance-free unit. In some cars, it can last for up to 10-15 years without any repairs. If an alternator fails, the car may still run for a short time on battery power. However, the engine will stall as soon as the battery charge is depleted. Replacing an alternator with a new OEM part is expensive, but there are alternatives. Read more below. 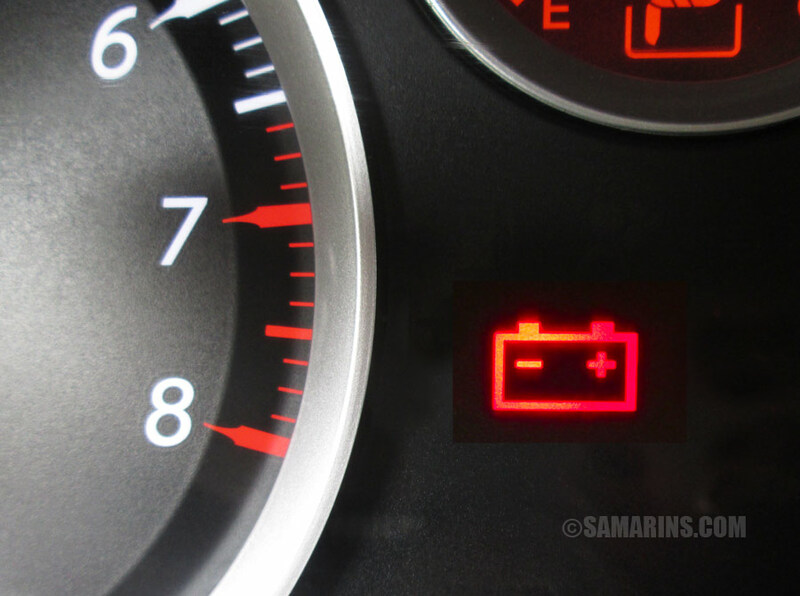 The most common symptom of a problem with your vehicle's charging system is a battery-shaped warning light (in the photo) or the "CHARGE" icon that comes on while driving. Normally this warning light should come on when you turn the ignition, but should disappears as soon as the engine is started. If it stays on, there is a problem with your charging system. The charging system warning light doesn't point directly to a failed alternator, although alternator problems are very common. Your mechanic will need to do further testing to pinpoint the defective part. Another symptom of a weak charging system is when the dash lights and headlights dim at idle, but become brighter when the engine is revved. This problem could be caused not only by a weak alternator, but also by a failing battery, poor connection at the battery terminals or a loose serpentine belt. A whining/buzzing noise coming from the alternator is another symptom of alternator troubles. In some cars, it could be caused by a noisy alternator bearing. 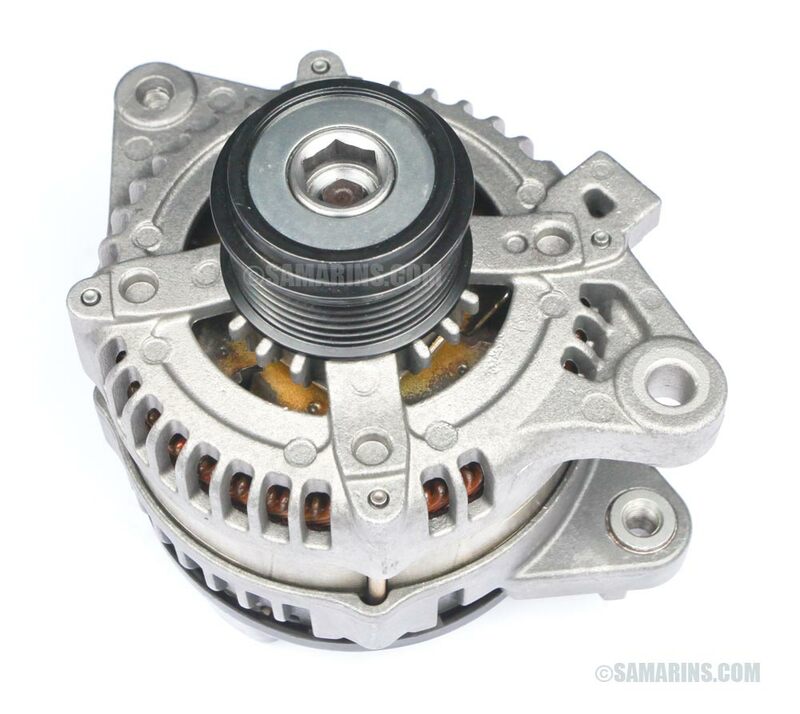 In some Jeep/Chrysler vehicles a bad alternator decoupler pulley could cause the same noise. Your mechanic can test the state of your charging system with the battery and charging system tester (in the photo). A battery and charging system test (AVR test) can cost from $30 to $50. The test can show if the charging system is weak or not working at all. It also can detect if one of the diodes inside the alternator has failed. If the charging system failed the test, your mechanic will need to do further diagnostic to see if it's the alternator or something else causing the problem. Other charging system problems include a loose drive belt, faulty wiring or blown fuse, defective ignition switch, etc. Read also: How to check a fuse in a car. 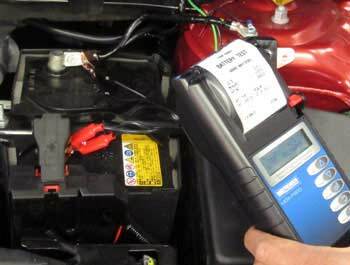 If no charging system tester is available, your mechanic can do a simple voltage test. 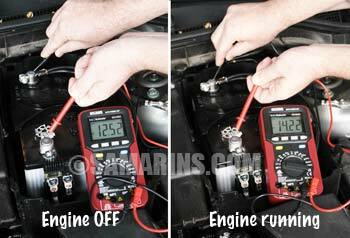 The test involves checking the battery voltage with the engine off and with the engine running. The battery voltage should increase once the engine is started, as the alternator supplies additional power (see the photo). If the battery voltage does not increase once the engine is started, there is a problem with the charging system. Replacing an alternator could be costly: $420 to $850. An original (OEM) part bough from a dealer is more expensive. An aftermarket or a rebuilt unit is cheaper. 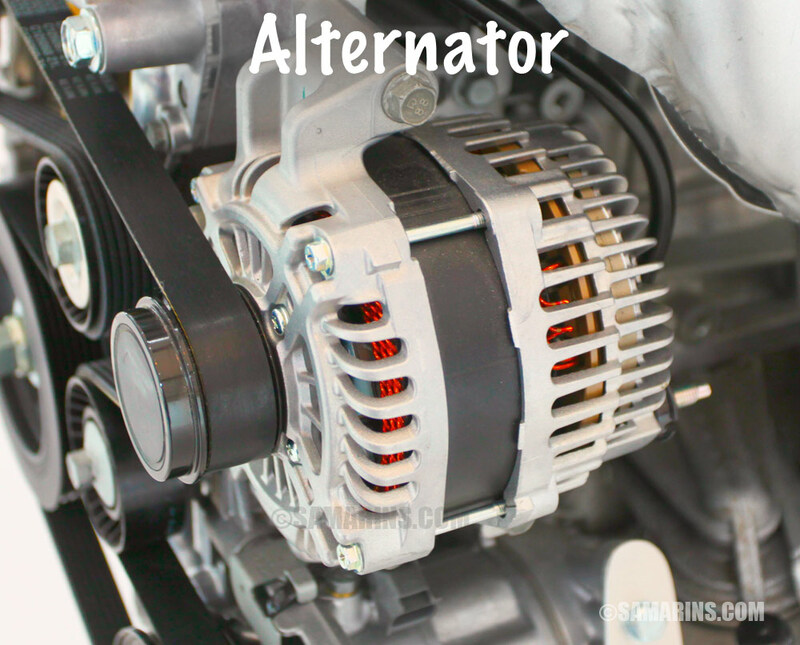 Another alternative is to have your alternator rebuilt. The way it works is your mechanic can remove the alternator and send it to the nearest alternator/starter rebuilding shop. Once the alternator is rebuilt, your mechanic will install it back. It may take more time, but it's usually cheaper, since you only pay the cost to remove and install ($70-$120) plus the rebuilder's charge ($80-$150). Rebuilding an alternator at home is difficult and takes a lot of time, but not impossible. Alternator rebuild kits are available online for $15-$50. Whenever the alternator is replaced, it's a good idea to change the serpentine belt too. It is not very expensive, and by replacing it together with the alternator, you can save on labor, as the serpentine belt has to be removed to replace the alternator. Read more about a serpentine belt. Often an alternator fails prematurely when a protective engine undercover or shield is damaged or missing. This happens because water splashing from the road gets inside the alternator and causes it to wear faster. If your engine undershield is damaged, have it replaced to keep the engine compartment clean and dry. A coolant or oil leak can also damage the alternator. Similarly, if you have to shampoo the engine compartment, the alternator must be protected from water and detergent. 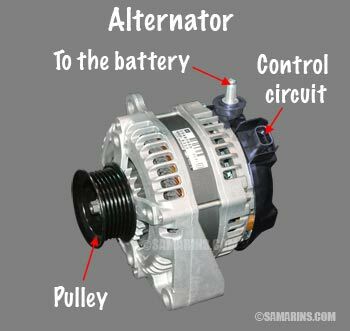 A typical AC car alternator has two windings: a stator (stationary outside winding) and a rotor (rotating inner winding). A voltage supplied through the voltage regulator to the rotor winding energizes the rotor and turns it into a magnet. The rotor is rotated by the engine via a drive belt. The magnetic field produced by the rotating rotor induces AC electric current in the stationary stator winding. Diodes are used to convert AC current into DC current used in the vehicle's electric system. The output voltage is controlled by the voltage regulator (photo below). Typically, a voltage regulator is built-in into the alternator. 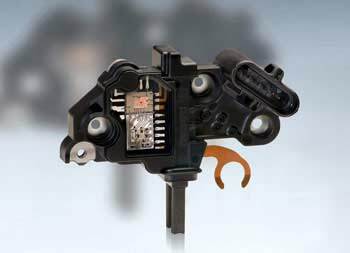 The most common alternator problems include worn carbon brushes (the two "legs" in this photo), worn contact rings (the two copper cylinders at the back of the rotor in the cutaway image) and a failed voltage regulator. Bad outer and inner alternator bearings (large and small silver cylinders in the cutaway image above) can produce a whining noise. When the alternator is rebuilt, the bearings, voltage regulator, brushes and some other parts are typically replaced with new ones.